PEMF: Pulsed Electromagnetic Field. PEMF is widely used in Eastern Europe and other parts of Europe, where it has been a standard therapy. While this is a new technology in North America it is really an innovative, emerging technology, with an already extensive research base behind it. 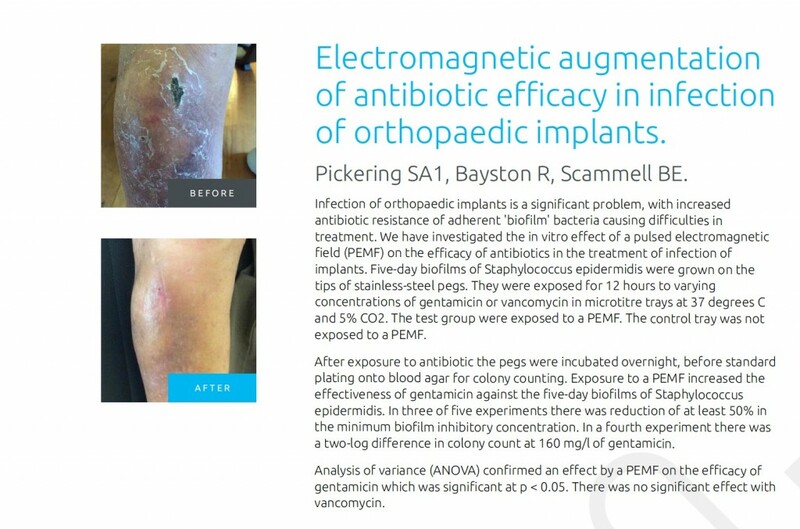 For more information about this revolutionary technology, check out the website: PEMFinfo.com. That boost to cellular activity helps to rejuvenate the cells, compelling them to help the area heal faster. 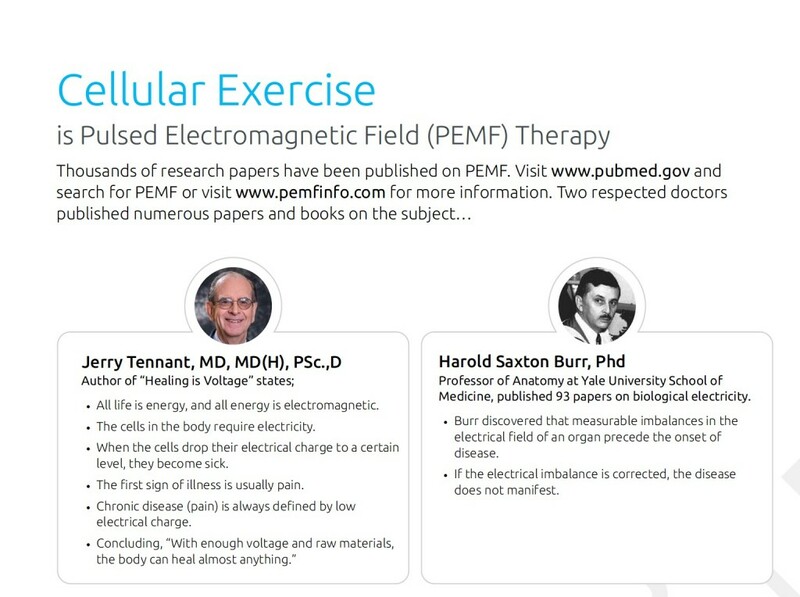 PEMF cellular exercise can also help the body use nutrients more efficiently. 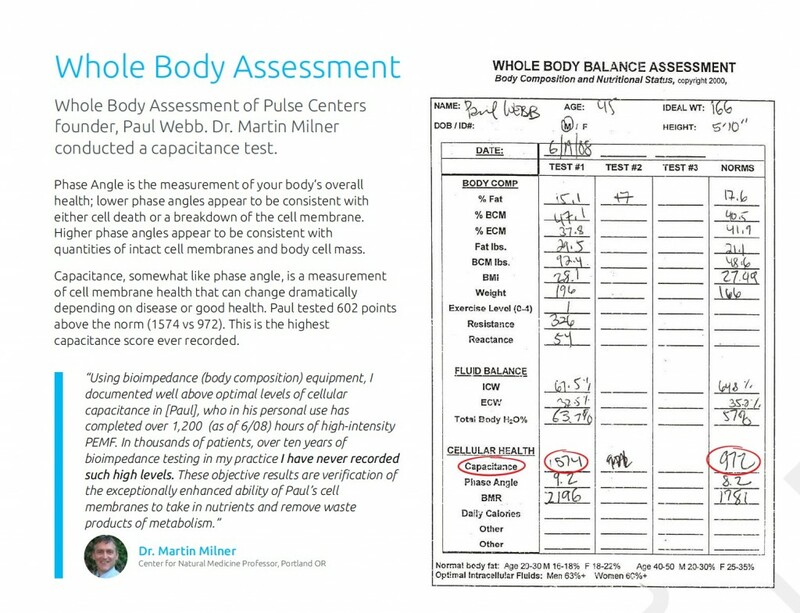 PEMF modalities aid in water absorption and eliminate cell stagnation. Altogether, PEMF helps to rejuvenate cells as well as optimize their overall functionality. Because of how PEMF works, it has seen widespread use in several areas. Cellular exercise is often used to help with pain and inflammation. PEMF sessions may also aid in increasing range of motion, improving mood, and increasing the body’s ability to get restful sleep. Since PEMF optimizes the body’s natural functions, it can serve to increase many bodily processes that slow down due to age, disease, or injury. Studies of all types are ongoing for using PEMF in various ways. PEMF is an effective, non-invasive and side effect-free antidote to pain. It directly affects nerve cells that are communicating to our brain that our body is experiencing pain. It has anti-inflammatory implications, helping to minimize pain. This also affects flexibility – especially when treating stiff and inflamed muscles. PEMF treatment increases the range of motion that can be achieved and results are often immediate. 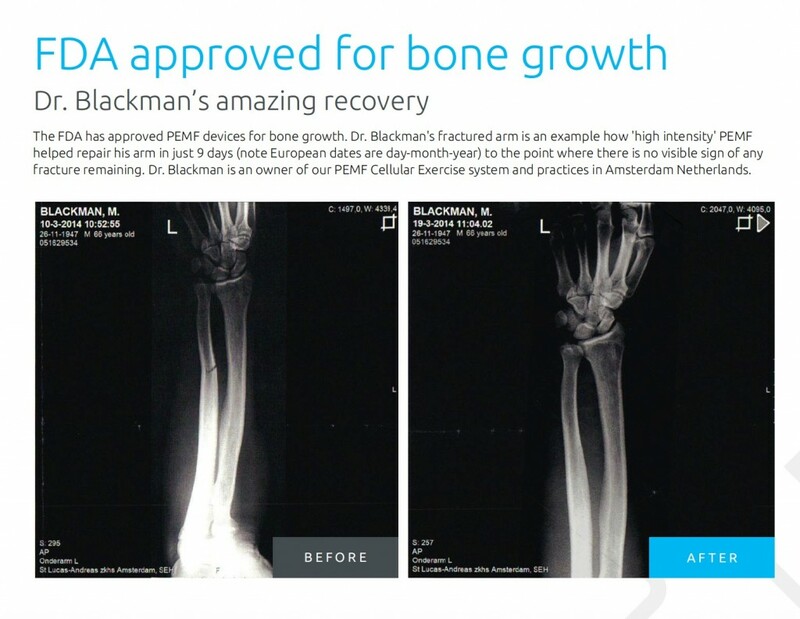 For bone fractures, PEMF is especially useful in healing non-union fractures. This is because electromagnetic waves are the earth’s tool to cause biochemical changes that ultimately result in an increased speed in bone formation. PEMF therapy has also been found to relieve depression and other mental health conditions. It’s also been used in treatment of everything from arthritis, cancer, heart disease, Alzheimer’s disease, Parkinson’s disease, to multiple sclerosis, autism, diabetes, and many other chronic health conditions. There is a therapy that perfectly complements chiropractic care called “pulsed electro-magnetic field” (PEMF) therapy. PEMF is the perfect complement to chiropractic care due to its effect on cellular function. Chiropractic adjustments restore the nerve impulse to cells, tissues and organs, …while PEMF strengthens and restores function to those cells that have been denied proper nerve energy due to the vertebral subluxation complex or from other interference. The effect is one of synergy, meaning the two together work better than either one alone.Learn more about cutting edge technology called pulsed electromagnetic field therapy. At Johnson Chiropractic Neurology & Nutrition we use the Pulse Centers XL PRO, which is the only PEMF Exercise system in the world to combine solid-state engineering, integrated electronics, user-controlled adjustable pulse and magnetic field strength, with up to 10Hz of pulsing power. Recharging your depleted cells and boosting your mitochondria is assisted by blasting your body with raw amounts of high-frequency pulsed electromagnetic fields. Many patients have received fast healing responses to bone fractures, tendon and muscle injuries and help with brain injuries and neuropathy. One recent success with our system enabled an 18 year long bout with pain to diminish to very low levels. Watch this informative podcast on Bulletproof Radio. Dave Asprey, founder of Bulletproof Coffee and operator of his renowned “bio-hacking” laboratory welcomes Gary Volino, the president of Pulse Centers, to Bulletproof Radio to talk about the revolutionary products his company is developing that are reshaping the medical field and revolutionizing the use of electromagnetic therapies. PEMF is an electro-magnetic field applied to a painful or dysfunctional area of the body. What makes this therapy so powerful is two things: the strength of the magnetic field generated by the machine; and the pulsating of the field around the part of the body that is not functioning properly. PEMF works by re-energizes damaged cells by inducing electrical changes within the cell that restore it to its normal healthy state. It improves the ability of the membrane of the cell to allow the oxygen, water and nutrients it needs into the cell…and allows the metabolic wastes to exit the cell in a normal manner. The pulsing action of the PEMF literally “exercises” the cells that are exposed to the magnetic field and allows them to normalize. Because of this cellular exercise, cellular metabolism is boosted, blood cells are regenerated, circulation is improved, and oxygen carrying capacity is increased. Weakened or damaged cells are the cause of many health problems. The treatment of these cells with energy allows them to return to normal function. Regaining normal cell function is the key to ALL healing! PEMF helps cells regain normal function. Take a look at the video below to learn more. You will be glad you did! IF YOU WOULD LIKE TO REVIEW SOME OF THE RESEARCH PUBLISHED ON PEMF, TAKE A LOOK AT THIS SITE. Is PEMF Safe And Are There Any Side Effects? These treatments are completely safe and there no side effects.Even the most chronic health problems can be helped—often after only a few treatments. We are Pulse Certified and that means we know how to effectively use our equipment to help you reach your health goals. PEMF treatments are completely painless. Treatments last from 5 to 15 minutes. Joint pain (shoulders, wrists, fingers, hips, knees ankles, feet, etc. 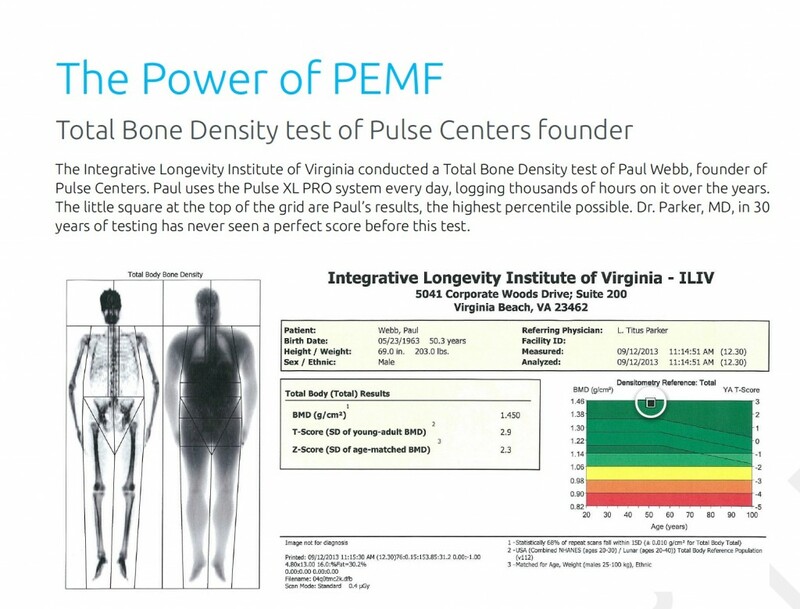 Thousands of studies on PEMF have been conducted by NASA, NIH, and other institutions around the world. *Note: Pulsed electromagnetic field devices (PEMF) are generators that produce a DC pulsed electromagnetic field of varying strengths delivered via insulated cables. No current of any kind comes into contact with the body. The magnetic field energy produced at the cable passes freely through living tissue for the purpose of cellular exercise to promote and support a sense of well-being. It is not a medical device. It has not been evaluated by the FDA. It is not intended for the diagnosis, treatment, or cure of any physical or medical condition, you should seek the advice of a medical professional before using PEMF as a form of cellular exercise.